Stainless steel is found everywhere in your kitchen – from the appliances to the drawers and cabinets. Keeping it in a perfectly clean condition is the key to have a magnificently looking kitchen. Even though it may sound like a pretty hard job, you are going to need help from professional cleaners for that task only in extreme cases. For the daily maintenance of your stainless steel surfaces, you will only have to follow several simple steps. If you want to use cleaning products for the job, make sure that you choose the right ones.Chemical cleaners, powders and pads could be pretty harsh to your stainless steel surfaces.When you are at the supermarket buying cleaning products, read the labels carefully – the ones you choose should not contain chlorine or bleach, because they cause irreparable damage to the finish of your stainless steel surfaces. Since homemade solutions are always cheaper, more accessible and in many cases equally effective as the commercially produced ones, you should know what would be best for your stainless steel. Vinegar, which has many applications in the household, is the answer to all your problems. White vinegar in a spray bottle works just as fine as any chemical cleaning product that you can think of. No matter whether you have a thorough kitchen cleaning underway, or you are just going to clean the stainless steel there, you should make sure to have a good supply of micro-fiber cloths.In contrast to paper towels for example, micro-fiber does not contain any lint, so it will not cause scratches on your surfaces. 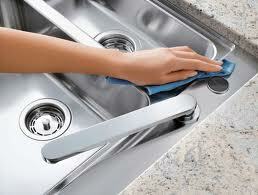 In order to avoid streaking, you have to use wide circular motions to wipe your stainless steel surfaces. First apply your cleaning solution (no matter whether it is a commercial one, or just vinegar) and let it stay for a minute so that it has time to absorb. Then use the micro-fiber cloth and wipe it in the way described. When you have to fight a serious case of greasing, rubbing (isopropyl) alcohol is your thing. Just wet the cloth with the alcohol and wipe the greased area, moving in one direction (up and down, or left and right). Applying baking soda on a stainless steel surface with burnt on food or other heavy-duty dirt for 20 minutes and then wiping it with a damp cloth is the best thing to do.